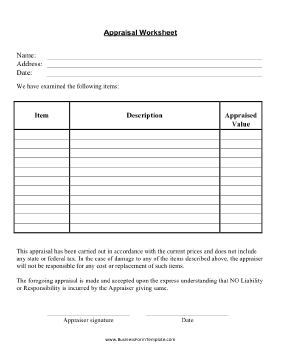 A professional appraiser of antiques, collectibles, jewelry, or any personal belongings of value can use this printable form as part of a formal appraisal. It includes a disclaimer of liability. This appraisal has been carried out in accordance with the current prices and does not include any state or federal tax. In the case of damage to any of the items described above, the appraiser will not be responsible for any cost or replacement of such items. The foregoing appraisal is made and accepted upon the express understanding that NO Liability or Responsibility is incurred by the Appraiser giving same.